Hi all, another quick post! It seems that today DevEPM is all around version documentation, upgrades and things like that 🙂 (see previous post about ODI Master Documentation). This tip was provided by Brian Suter, our co-worker (Thanks dude!!!). Do you know that Oracle has a tool that show us the features released between two versions? 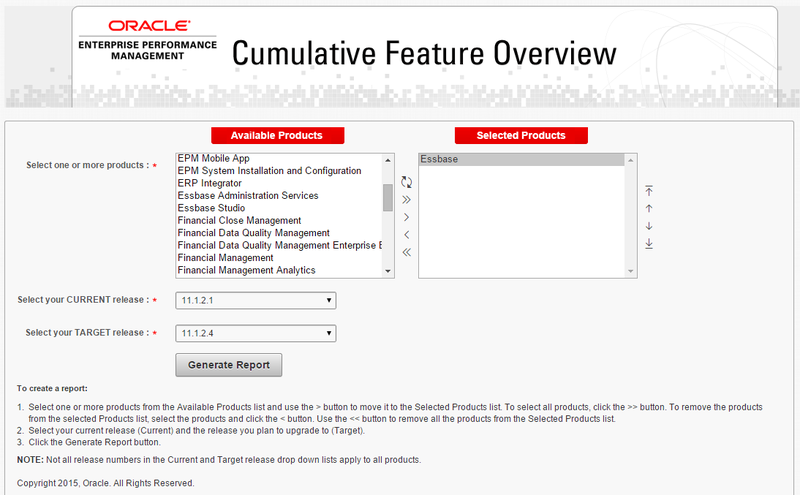 It is called EPM Cumulative Feature Overview. It is a very straight forward site where you pick one or more EPM products, select the current version that you are in and the target version that you are planning to go, click in “Generate Report” and that’s it! This is an awesome tool to better plan if it is worthy or not to upgrade and what benefits this upgrade will bring to your project.